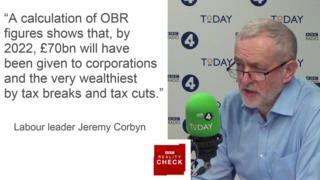 Reality Check: Is government giving away £70bn to the rich? The claim: The government is giving away £70bn to corporations and the country's wealthiest people. Reality Check verdict: Labour's estimate of £70bn in lost revenue does come from official forecasts, but it includes tax cuts going back to 2010 and does not take into account other changes to corporation tax reliefs and allowances, which will bring in revenue. Labour leader Jeremy Corbyn has attacked the government for planning to give away £70bn to companies and rich people by 2022. His party says it reached the figure in consultation with the House of Commons Library, based on data about the cost of policy decisions collected by the Office for Budget Responsibility (OBR), an official economic watchdog. The overwhelming majority of Labour's £70bn figure comes from cuts to corporation tax: the tax that businesses pay on their profits. Labour says this alone will result in lost revenue of more than £60bn between 2016 and 2022. George Osborne repeatedly announced reductions to corporation tax when he was chancellor, taking the tax rate from 28% to a planned 17% by 2020. Looking at these cuts, and other changes to allowances and reliefs that reduce bills for businesses, the total cost to the public purse is estimated at about £62bn between 2016-17 and 2021-22. Although the £62bn loss is incurred in these years, Labour is actually talking about policy changes that were announced as far back as 2010, when the party lost power. These smaller changes take the total giveaway to about £70bn. So taken on its own terms, Labour's figure makes sense. But it only gives one side of the story. Over the same period the government also announced other changes to corporation tax allowances and reliefs that will recoup £32bn, about half the headline cut. Furthermore, on Sunday, shadow business secretary Rebecca Long Bailey told the BBC's Andrew Marr Show six times the government was giving away £70bn in tax breaks "by 2020". But Labour's own analysis is clear: the figure covers the cost over six years.